With apologies to all “cooking for one” cooks. To me, cooking for one is like performing in an empty theater. This unattractive opinion is based on the fact that I’m spoiled. In 1977 when I started seriously hanging around our New York kitchen those mostly futile attempts were supported, guided and tolerated by Cathie who was and is an excellent Julia Child devoted cook. Those days and many thereafter produced dreadful results, but like all things new, it took trial and error, mostly error to get up and crawling. 2. Prepare the Rice according to the package directions. When its cooked, allow it to slightly cool before you transfer it to a large mixing bowl. 3. Add the dried Thyme, Salt & Pepper & the dissolved Demi Glace stock. Gently mix it all together. 4. Butter an oven proof deep sided casserole dish. Add the Rice mixture & a pinch of Thyme on top, and dot with the TB of Butter. 5. Place the casserole on the upper level of the oven & bake until the surface begins to color. About 20 minutes. Turn on the broiler & broil for a few minutes. The Rice should take on a lightly broiled appearance. 1. Heat the oven to 425degrees. 2. Heat a cast iron grill pan to high. 3. Season both sides of the Lamb with Salt, Pepper & EVOO. Place in the grill pan & sear for 2 minutes a side. Add the cup of Chicken Broth & move the pan & its contents to the oven & bake for no more than 12 minutes. 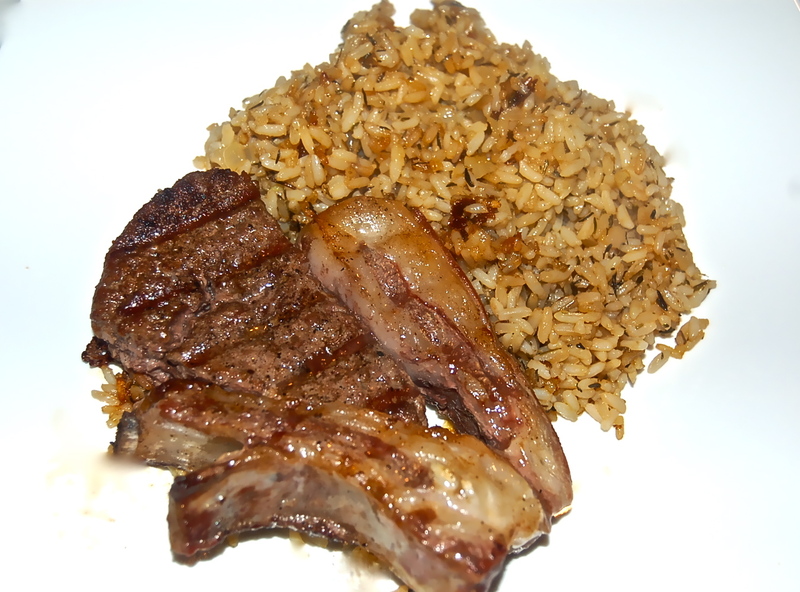 The Riblet & the ground Lamb should not be overcooked or it will dry out.